These rules are to be read in conjunction with the club notice board. OUT OF BOUNDS: Defined by boundary fences and any area marked by white markers. WATER HAZARDS: Defined by yellow markers. 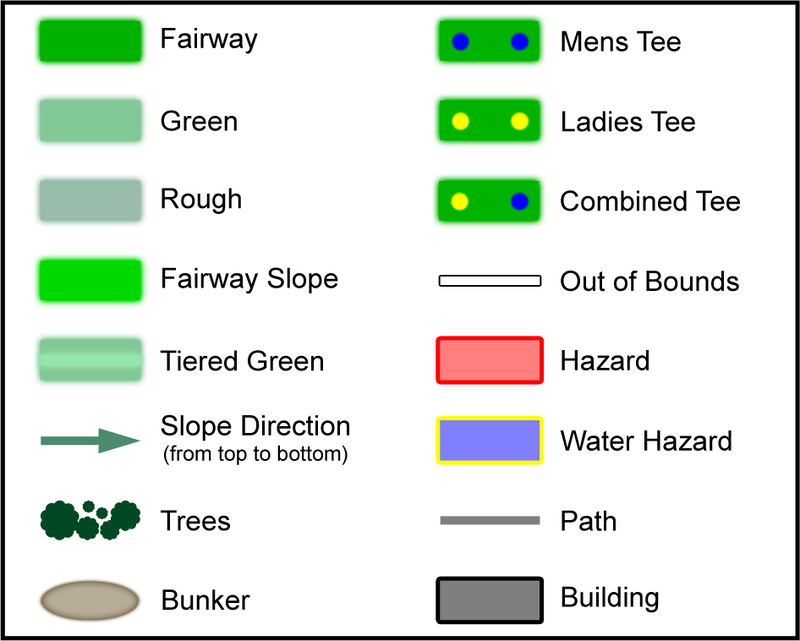 LATERAL WATER HAZARDS: Defined by red markers. IMMOVABLE OBSTRUCTIONS: Irrigation equipment, bridges, fairway, stiles, signs, tractor sheds & workshops, power poles, drinking fountains, toilets. LIFTING WITHOUT PENALTY: To be dropped within one club length (NNH) from any cut drain (not already defined as a hazard), tree stumps, embedded rocks, tree stakes, paths and roads, wheel tracks, drain covers and garden on left side of path on 18 fairway. DROP ZONES: Ball in hazards behind No. 3 green, No. 5 green, No. 18 green and in front on No. 6 teeing ground, may be dropped in nearest drop zone - one stroke penalty. TRUNDLER PARKS: Designated trundler parks on No. 4 and No. 8 fairways - No penalty for striking equipment. DISTANCE MARKERS: Measured to the centre of the green. Blue - 180m, White (and marker trees) - 135m, Red - 90m. Repair pitch marks on greens. Use the litter bins provided. A reasonable standard of dress is expected at all times on the course and in the clubhouse. Shoes worn on the course are not permitted in the clubhouse (past the locker rooms). Singlets, jandals and bare feet are unacceptable.